As promised yesterday, here’s a detailed account of the gymnastics required to extract usable data from Transparency International’s Corruption Perception Index (CPI) reports. The reports are published as yearly editions for each of the 11 years since 1998. They’re not consolidated, at least not anywhere I can find, so if you want to analyze trends in the TI data you’ve got to consolidate those reports yourself. The yearly reports are available as both HTML tables and corresponding Excel spreadsheets. I didn’t know about the latter. The website is organized such that for the recent years I examined first, only the HTML table is obviously available. So the procedure I’ll show here wasn’t strictly necessary. I could have gone straight to the Excel files. But in the end it’s the same data, and all the subsequent processing is necessary in either case. So I’ll take this opportunity to show how to use Excel to extract data from an HTML table. That’s a really common operation if you’re into this sort of thing, and Excel does it pretty well. To import it into Excel 2007, first visit the page and capture its URL. Then, in Excel, do Data -> From Web -> From Web (Classic Mode), navigate to the table you want, click the arrow at its top left corner, and click Import. That was the easy part. Before long, I had a spreadsheet with 11 CPI reports. 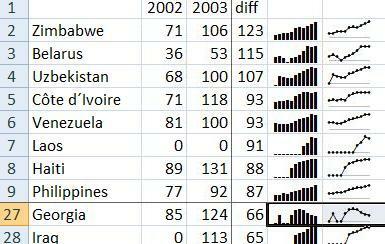 To simplify things, I stripped each one down to just two columns: country name and CPI rank. I wanted to see trends in the ranking over time. To do that, I needed to merge the 11 sheets into a single sheet with a column of normalized names, and 11 columns of normalized ranking data. The rankings had to be normalized because sometimes countries are tied for a rank. In those cases (as above) some of the files were sparse, with empty cells for repeated ranking. In other cases, all cells were populated. As you can see, the bulk of this script is really just data, in the form of search/replace pairs. Its output is another CSV file. It took me a few tries to reduce the list of names to a normalized core. I ran the script, took the output into Excel, eyeballed the list, and added new search/replace pairs. Eventually I wound up with this data, which I brought back into Excel to explore. Because I wanted to look at what I’m calling volatility — that is, the variability in CPI rankings — I added a column that computes the difference between a country’s highest and lowest rankings over the 11-year period, and then sorts countries by that difference, from most to least volatile. We can debate whether a stack of sparklines is a useful way to visualize trends in this data, but that’s the approach I decided to try. It gave me a chance to experiment with some of the sparkline kits available for Excel, and the one I settled on is BonaVista’s MicroCharts. These microcharts do succeed in telling stories about each country individually, while also making it possible to notice that Georgia, atypically among the more volatile countries, is moving toward a lower (better) ranking. In another variation on this theme, I flipped the rankings to their negative counterparts so that the charts would flip too, and would correspond to my natural sense that up means better and lower means worse. I also removed the zeroes so that they wouldn’t show up as data points. That was good enough for my purposes, but when I converted the spreadsheet back to HTML I wasn’t happy with the results. That’s partly because the microcharts, which are rendered using TrueType fonts, had to be converted to lower-resolution images. And it’s partly because the HTML that Excel generated was too complicated for my WordPress blog to handle gracefully. So I exported the enhanced data back out to a CSV file, and switched to Python again. There are a million ways to generate sparklines from data, but the one I remembered from a previous encounter was Joe Gregorio’s handy sparkline service. (By the way, it should be possible to use that web-based service from Excel. And interactively, you can. If you capture a sparkline URL like this one, you can paste it into the File Open dialog presented by Excel’s Insert -> Picture feature. The dialog asks for a filename, but you can give it an URL and it’ll work. By specifying upper=1 and below-color=white in the sparkline-generating URL, the zeroes (representing unreported data) vanish from the charts. I’m using Python here partly as a shell language. It invokes a pair of command-line utilities: cURL to download images, and mogrify (part of the ImageMagick suite) to flip them. Although one of these commands is a cloud-based sparkline service, and the other is a locally-installed image processing program, they’re treated in exactly the same way. When the quantities of data involved are small — these .PNG images are just a few hundred bytes — there’s no discernible difference between the two modes. I like that symmetry. What I don’t like is all the moving parts. It’s awkward for me to move from Excel to Python to Excel to Python, with excursions to the command line along the way, and no normal person would even consider doing that. In a simple case like this, such gymnastics should never have been required. If you’re going to publish data to the web, assume that people will want to use it and do the minimal basic hygiene and consolidation. At some point, though, people will want to do fancier tricks. Today you have to be a “data geek” to perform them, but that shouldn’t be so. We’ve got to find a way to integrate Excel, dynamic scripting, command-line voodoo, and web publishing into a suite of capabilities that’s much more accessible. Nice flexibility on those maneuvers! I have my own Ruby toolkit for scraping/munging/joining data and exporting as a nicer format for using in other tools. Of course, it’s also possible for various services to wrangle this data and offer it in more broadly used formats. For example, we have the CPI for several years on GeoCommons. Download as Shapefile, KML, and CSV – or visualize against other open data. The Ivory Coast dilemma reminds me a another anecdote in data wrangling. The last fm folks (who have to deal with the vagaries of user-submitted mp3 metadata) were experimenting last year with a fingerprinting technique to normalize metadata. They came up with Top 100 ways to write: Guns N’ Roses – Knockin’ on Heaven’s Door. Special Characters galore and its Siamese twin Structured Data. Interesting post… did a quick look to see if I could import into OpenOffice, since I don’t use Microsoft tools… and yes I could, though not with any graphical preview… found it under Insert -> Link to External Data, inserted the URL and hit enter. Then I got a list of things it could import, but no preview. This changes the data underneath a chart allowing you to use one chart to display hundreds of data series. You can then use VB Chart.Export (not sure exactly what the function call is) to write each of those charts out to hundreds of GIF images. Then include those charts in your HTML. The sheer insanity of that video still makes me laugh. I have looked at GeoCommons before, very nice! How would you use it to compare, say, CPI 2008 vs world income inequality? I just tried that, and could not come up with a visualization I liked. Would be interested to see your solution. Of course Jeff Jonas would say this is a good thing. This cloud of associations is a better definition of the entity! JSON is a beautiful thing. But when we of the geek tribe discuss the pros and cons of JSON vs XML vs CSV, we’re off in the weeds. The problems I ran into here have nothing to do with delivery format. It’s all in the data management. As we saw here, typos, variant encodings, and format inconsistencies were expressed identically in HTML and XLS, and would be expressed the same way in JSON or XML or any other deliver format. We need to give people more upstream assistance so they can avoid the typos, variant encodings, and format inconsistencies in the first place. There’s nothing insane about it at all. Disney made animations a cel at a time. Pixar still does, thanks to automation. This is cool. And yet, I would like to see more granularity. You ought to be able to bookmark any frame for reference. You ought to be able to grab the sequence of frames and render it in alternate ways, even as a printed “small multiples” poster. You mention not liking to move back and forth between Excel and Python. Did you consider trying to do all the work in Resolver http://resolversystems.com/ which you profiled earlier on your blog? Yes. But In Resolver I couldn’t, among other things, use an Excel sparkline add-in, and that was part of what I wanted to explore. Ah, the Excel thing is the deal-breaker. Otherwise I was going to mention a way of getting XML out of an online HTML table semi-automagically via Google Spreadsheets. But not I won’t. > But now I won’t. Why not? There are a zillion good solutions worth mentioning. I focused on Excel here because I wanted to try the inline sparkline thing. Your comment prompted me to check if GSheets can insert a sparkline image from an URL like http://bitworking.org/projects/sparklines/spark.cgi?type=smooth&d=88,84,82,92,82,86,66,82,44,64,66,88,96,80,24,26,14,0,0,26,8,6,6,24,52,66,36,6,10,14,30&height=20&limits=0,100&min-m=false&max-m=false&last-m=false&min-color=red&max-color=blue&last-color=green&step=2. It can, but onto the sheet not into a cell. Putting multiple sparklines into a column, and then sorting on other columns, was a nice aspect of this experiment, and one that I’ve yet to replicate online. There are many kinds of tears: sorrow, humiliation, guilt, shame, joyousness, young lady, despondency, hope. God knows them all and what is in our hearts. But trouble is that Samson refused to think himself seriously or to resume Demiurge seriously.